I can call this dish my “forte”; it is one of my favorites and always makes an awesome impression when I serve it to my guests. Making fresh pasta doesn’t requires exceptional abilities, you only have to get used to it. The first time it will take you maybe 1 hour to make, the second time 45 minutes and so on. Making stuffed pasta such as Ravioli, certainly requires some time. But it will be all worth it! All the ingredients in this dish are well balanced: the aromatic smoked salmon with the ricotta, the tangy lemon with the cream and a sprinkle of chives and pink pepper everywhere. The final result is so delicate yet so tasty. It’s a show stopper. To make fresh pasta you don’t need to spend a lot of money in pricey machinery. All you need is a working space (a large cutting board or a table made of wood or marble) and a rolling pin. Of course if you wish to invest in the craft, you can buy a pasta machine (it will certainly save you a lot of time) and the pasta sheets will be of even thickness. Make the dough as described in the recipe instructions and let it rest. When it’s time to roll it out, divide it in 4 parts and work on 1 by 1, keeping the remaining dough still wrapped to prevent it from drying. Roll out the dough. If you’re using a pasta machine, start with the widest thickness and slowly roll it thinner and thinner until it’s almost translucent. 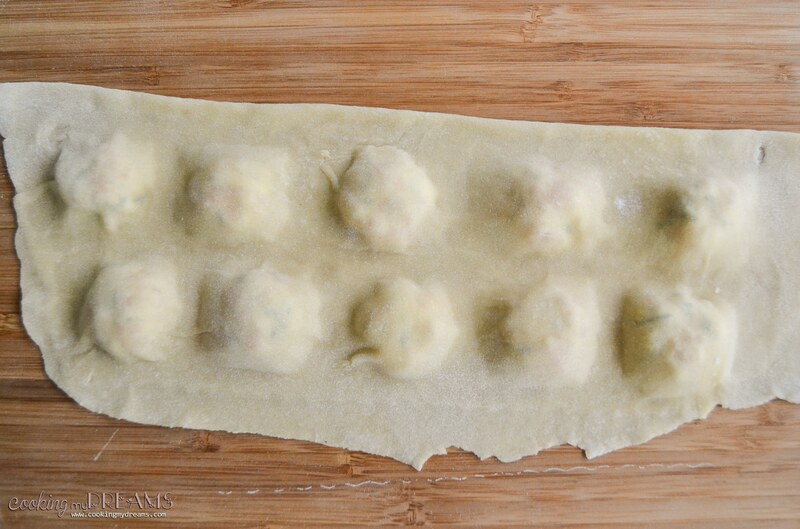 Since the ravioli have 2 layers of pasta, the sheets should be quite thin so that the overlaying side it’s not too thick but also not too thin that will break during the boiling. If you roll it by hand, make a square shape and place the stuffing only on the lower part of the sheet so it can be overlayed with the top part. If you’re using a pasta machine you can simply use 2 separate sheets. The stuffing should not be too large nor too small. Leave enough space (as big as the filling itself) around it to make sure you can cut it out easily. 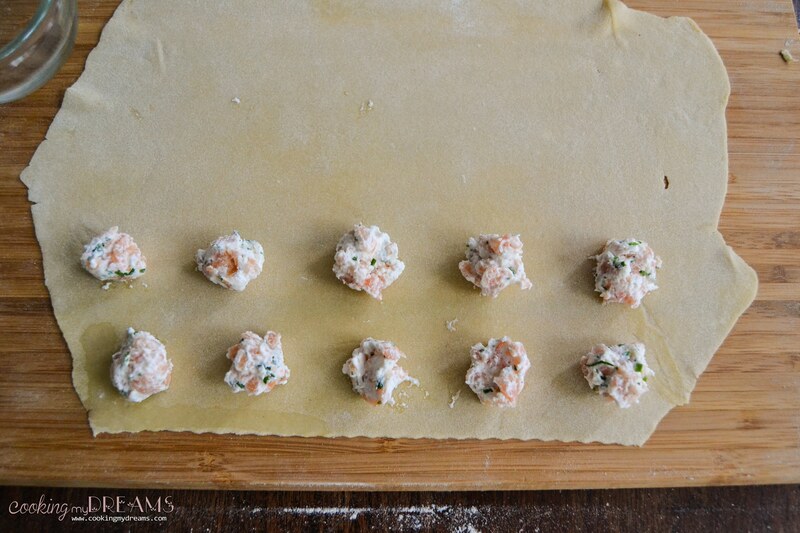 Cover with the other sheet of pasta and cut the ravioli. It’s not necessary to seal the edges with a fork after the assembly but if you don’t want the ravioli to open during the boiling, make sure you slightly brush the edges of both sheets of pasta with water and press well down with your fingers to stick them together, making sure all the air gets out otherwise it will create a bubble. Let them rest at least 10 minutes before boiling, so the water dries and the pasta sheets stick well together. Now cover the dough in plastic wrap and set aside to rest for 10-15 minutes. Just enough time to make the filling. Finely chop the smoked salmon and mix it with the ricotta in a bowl. Season with salt and pepper and add the finely chopped parsley. Cover the bowl with plastic wrap and set it aside in the fridge. 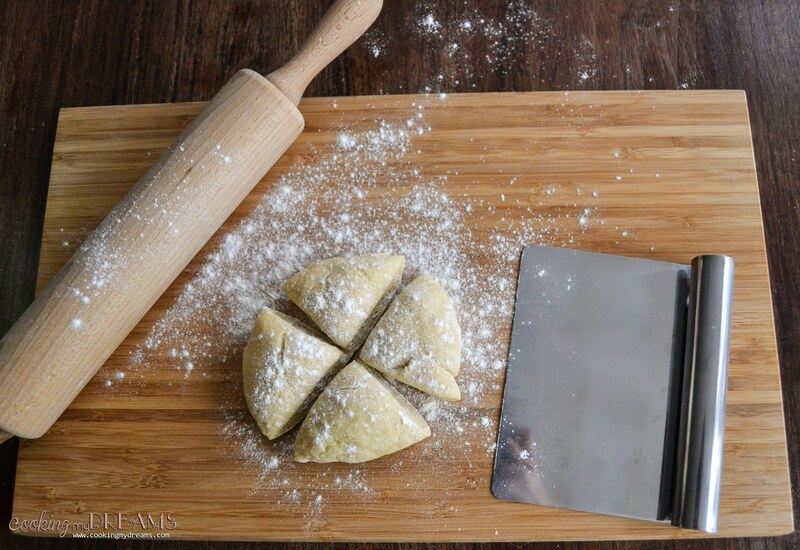 Remove the plastic wrap and cut the dough into 4 equal parts. Take one and cover the others again with the plastic wrap. Proceed with the same process also for the rest of the dough. With a teaspoon or a sac-a-poche place the filling in the center, brush with water around the filling and cover with the other pasta sheet. 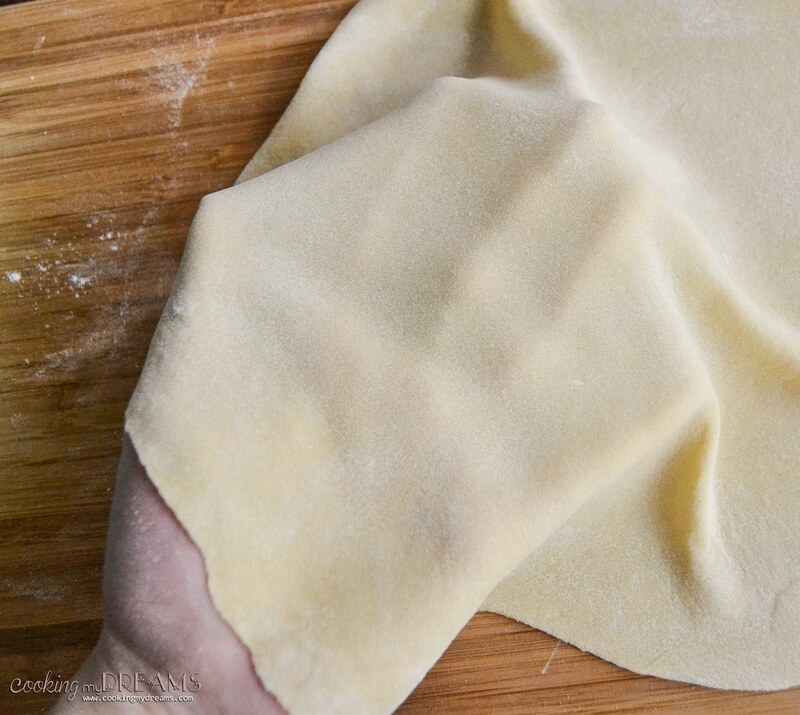 Pinch with your finger starting from one side and slowly all around to also remove the air from inside the ravioli. Cut the ravioli, then press again the edges with your fingers to make sure they're well stick together and then set the ravioli aside on the clean cloth to rest. Proceed with the same process for the rest of the pasta. Let them cook about 3-4 minutes (the cooking time mostly depends on the thickness of your pasta. Taste one to make sure is al dente). Meanwhile in a pan bring to simmer the cream and squeeze in it the lemon juice, season with salt and pepper. 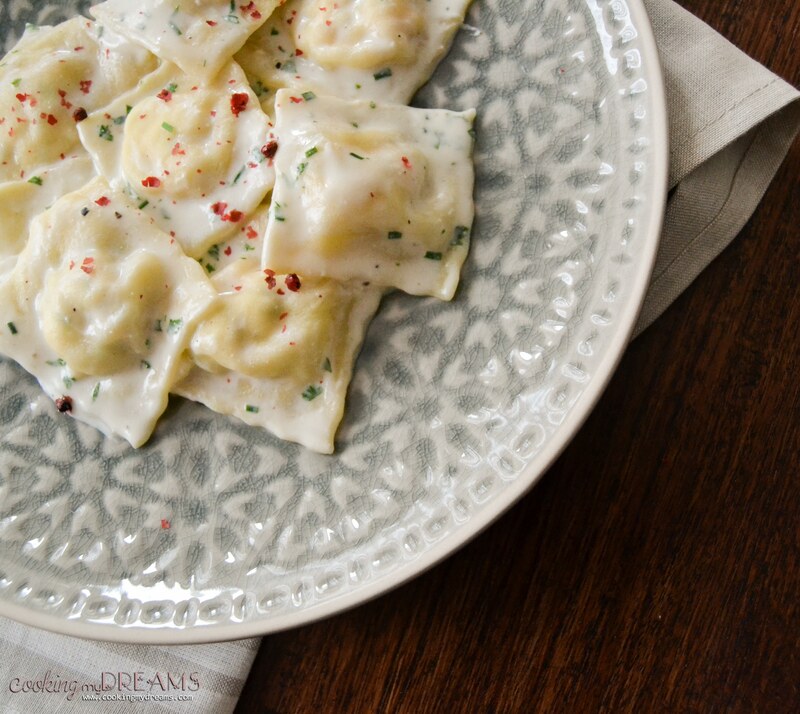 When the ravioli are cooked, add them to lemon cream sauce and finally add the chopped chives and parsley. Add some pink peppercorns on top for extra bold flavor. This looks so lovely! I think the addition of pink peppercorns is wonderful. They are often overlooked! Beautiful work! Thank you! I love pink peppercorns and I try to use them as much as possible. They add a great level of flavour. 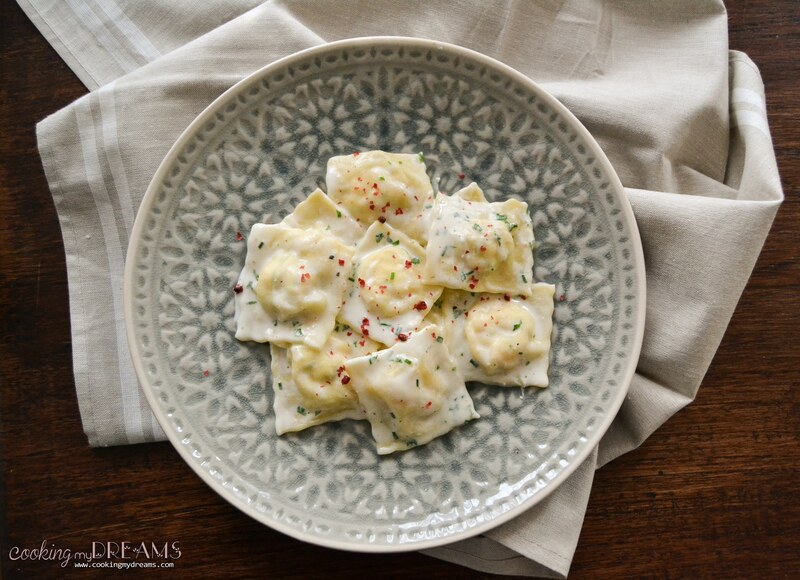 I’ve always wanted to try making homemade ravioli but never have. Yours looks perfect, and I love the flavors in this dish! Love homemade ravioli! Your version looks really tasty, and it’s really handy to see these step-by-step photos! I have never made my own ravioli before but I’m thinking I need to now. I absolutely love smoked salmon in creamy pasta sauces. It’s one of the best pasta sauce flavors in my opinion. This recipe looks amazing! 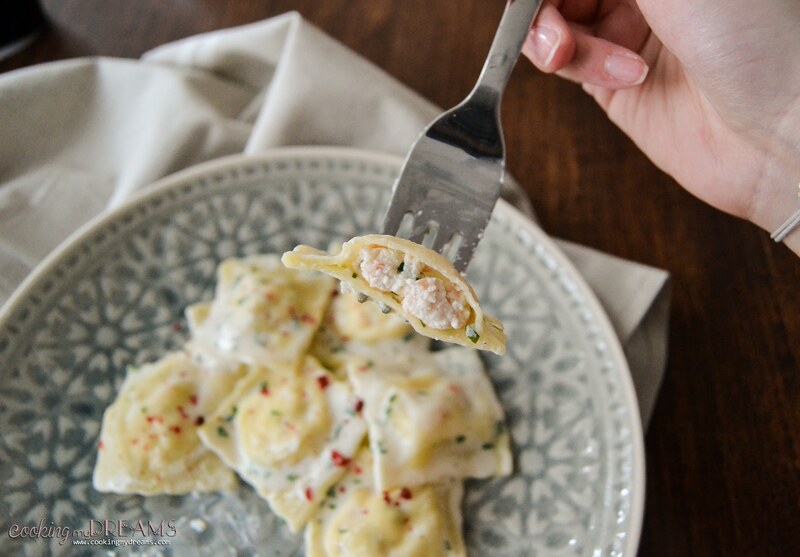 These ravioli are absolutely gorgeous! My 6yo loves smoked salmon – I bet he’d be thrilled if I served this for dinner one night. Yum! What a delicious sounding combination! We love salmon in this household so I’m sure this would be a hit! 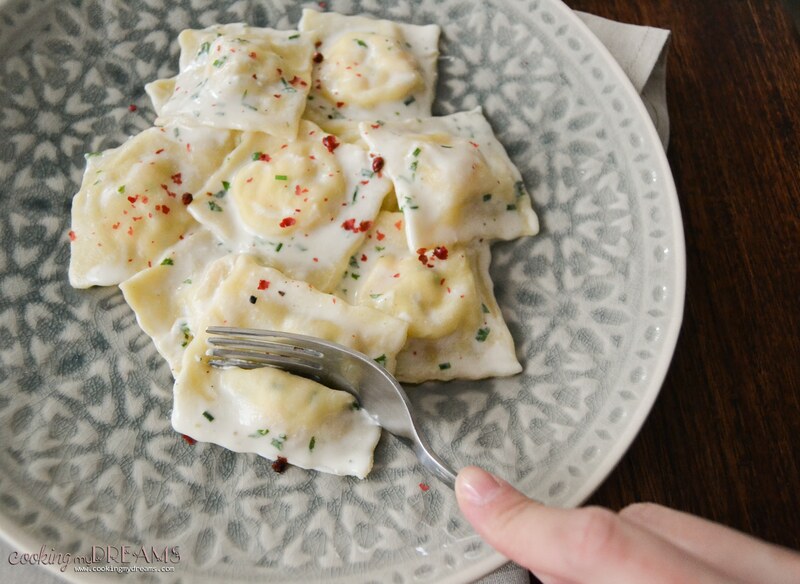 This ravioli looks superb,love your post to learn how to make it from scratch. I am actually am going to test a ravioli dish idea this week. I bought premade ravioli and you made it from scratch. I really need to step my game up. 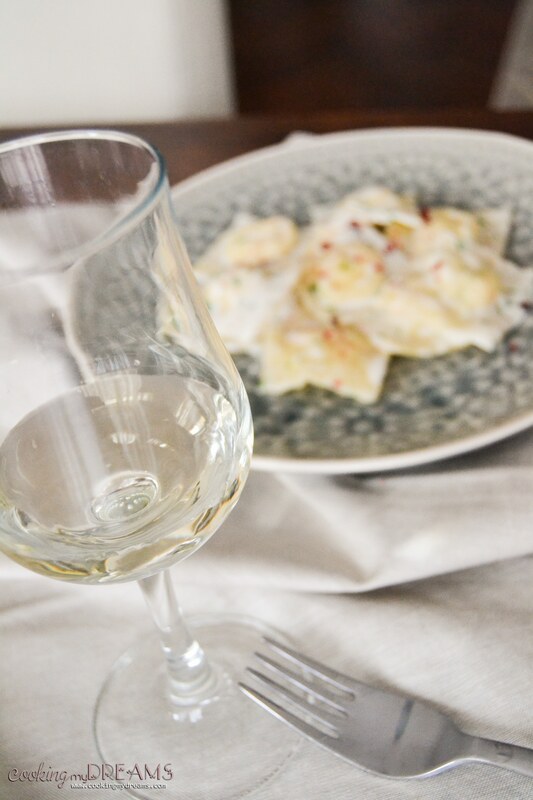 I am loving the flavours you have used in your ravioli! Can’t wait to try it! Yum, all those flavors! I need to try my hand at making my own pasta one day. This recipe is really making me want to do it! Ricotta and salmon pair so wonderful together. I love this combo. Can’t wait to make this for my family. It’s perfect family dinner if you ask me. My kiddo is such a fan of ravioli. What a delicious, different ravioli! Your step-by-step instructions make the recipe seem incredible doable. We love homemade pasta, pinning this recipe to make soon. Thanks for sharing! Yummy!! I have to try this recipe. Pics are beautiful. Great blog, thanks!!! JESSICA, thanks! Very tasty ravioli turned out. Very cool photos! Jessica, it’s really awesome! This will quickly become a favorite in our house!